On August 11, we participated in the inaugural #MommyBrainPlaydate powered by MOMMY BRAiN! This event was hosted at the lovely Snooknuk Cafe in Larchmont Village. We did a book reading and talked about the importance of embracing our uniqueness. Ravelle Worthington, founder of MOMMY BRAiN. Through her site and live events, you're able to connect with like-minded moms. Peruse her site and you'll find fun places to take your kids and product reviews from trusted sources. Jennifer Vassel, founder of I Am Unique! We're sure you know her already (wink). But in case you don't, you can visit our About page. Cheri Jacobs, founder of Snooknuk Cafe. This cafe/play place is any kid's DREAM. It features a magical indoor playground for kids and a performing arts studio with a top notch line up of classes. You can even host birthday parties here - just ask actor Lance Gross and singer Kelly Rowland! 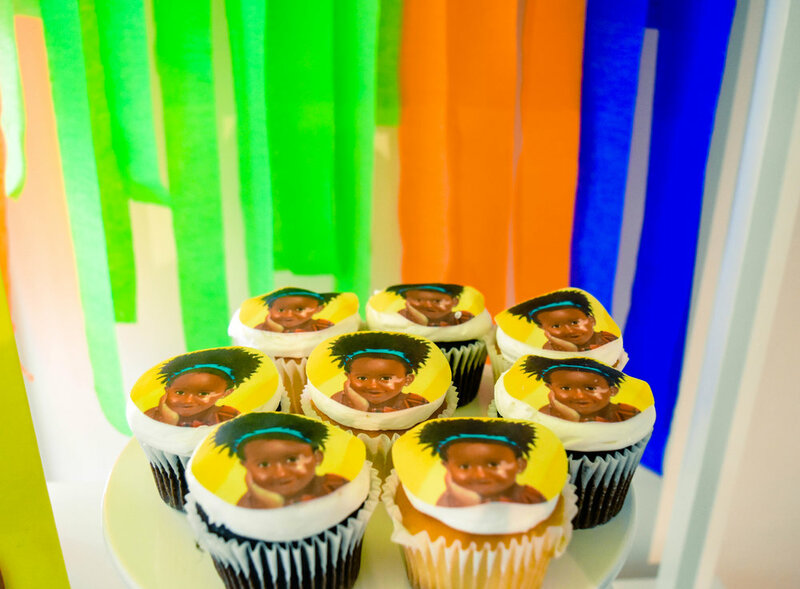 We couldn't get over how cute and yummy the Erin cupcakes were! They were provided by Celebrate by Shawn. Check them out for your next themed kid event - they even have a candy cart you can rent! #MommyBrainPlaydate was a hit. The kids were engaged during the reading, and later had fun playing and snacking on the cupcakes. One little girl was eager to snag a picture with Erin. Is it just us, or is the resemblance uncanny?! Make sure you stay close to MOMMY BRAiN, as they'll have other curated #MommyBrainPlaydate events for you and your littles to enjoy. 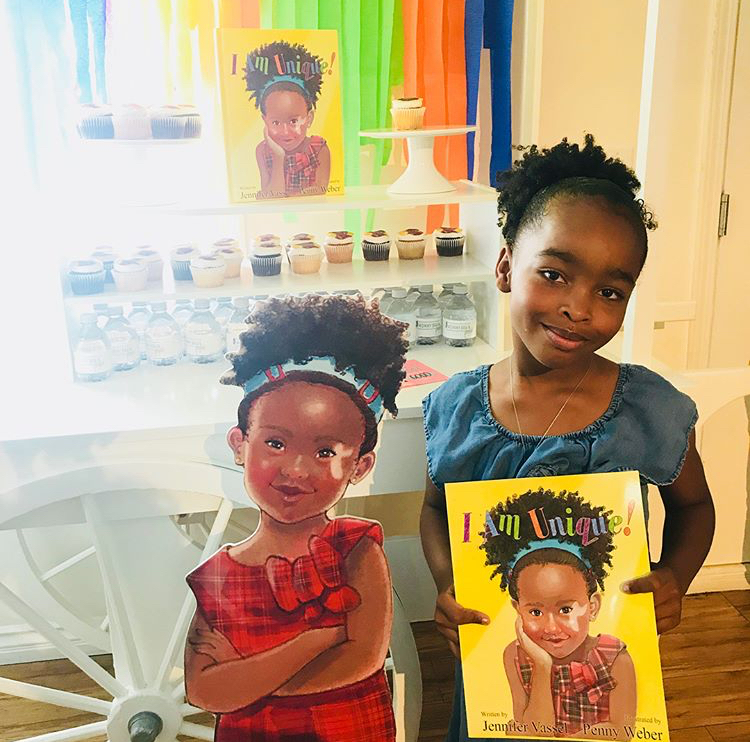 Last week, we had the pleasure of partnering with the National Organization of Jamaican and Supportive Organizations (NAJASO) and read "I Am Unique!" to the students at Marcus Garvey Elementary School in Inglewood, CA. After the reading, the teachers let the kids out for recess. A few of the volunteers and Jennifer went out to join them. Some of the girls ran up to Jennifer to share that they, too have birthmarks and showed her where there’s were. We brought some copies of "I Am Unique!" out and the girls were eager to read the story out loud. It's so important for young people to see themselves positively represented in the content they consume. We are so grateful to be in a position to serve as an example for younger generations. Jennifer learned so much from participating in Zuventurez's pitch competition last year, so when they asked her to come back and share some tips with the entrepreneurs, she couldn't resist. The teams wanted to know how she was able to weave her story into her 5-minute pitch so seamlessly. Her strategy was to lean more on the story vs. the financials (which was another one of the components required in the pitch). The most common question Jennifer gets when she talks about "I Am Unique!" is, "What was the inspiration behind writing this book?" That leads us to believe that people care more about WHY you do something vs. WHAT you do (side note: watch Simon Sinek's Ted Talk on how great leaders inspire action). Jennifer might not have been able to convince the judges that our brand is scalable, but that didn't stop her from getting the highest score on all the rounds leading up to the final pitch. On June 2, Jennifer, along with 8 other entrepreneurs, pitched their businesses for a chance to be the local winner of InnovateHER, powered by the LA Black Investors Club. InnovateHER is a pitch competition that provides an opportunity for entrepreneurs to showcase innovative products or services that help impact and empower the lives of women and families.The competition was held at The Creative House in Downtown Inglewood. If you're selected as the local winner, you then are entered into another pool where the Small Business Association (SBA) chooses 10 finalists to pitch at the National InnovateHER Conference in 2017. The finalists compete for as much as $40,000 for their business! Jennifer was the runner up, so she wasn't selected as the local winner. Nonetheless, she met some incredible people at the event. Some of them are pictured above. They all have different journeys, but they have one thing in common: they have a vision and are audacious enough to see it through. In celebration of World Literacy Day, the folks over at Southbay Pavillion held a Cool Kids Read event. Cool Kids Read shows kids the fun of reading through games, facepainting, and reading throughout the day. Jennifer read our story to the attendees. Parents also came by the book to learn more about the story. Her Eyes Matter is an event powered by Black Businesswomen Rock, a community committed to increasing the network and net worth of black businesswomen around the world. We spent a sunny afternoon on a mother-daughter picnic at Liberty Park in Cerritos, CA. Attendees participated in hula hoop and double dutch contents, mother-daughter time, and a reading from Jennifer. The girls were attentive and participated in the Q&A discussion afterward. It was nice to build community and absorb some of that good ol' vitamin D.
Read Lead is an educational initiative that provides literacy and leadership opportunities for youth and young adults in Los Angeles County. They are also the official site sponsor of the national Children’s Defense Fund Freedom Schools program. The CDF Freedom Schools® program seeks to empower children to make a difference in their communities, families, and most importantly - themselves. By providing summer and after-school reading enrichment for children who might otherwise not have access to books, the CDF Freedom Schools program plays a much needed role in helping to curb summer learning loss and close achievement gaps. One of Read Lead's programs is Read Aloud, where guests from the community are invited to come and read to the students. When Jennifer was invited to read I Am Unique! at Compton's Freedom School, she couldn't resist. The kids were lively and full of energy! We fully support Read and the CDF Freedom School's partnership. To learn more about Read Lead and the other amazing programs they offer, visit their site here. Beauty, Brains, and Bling (BBB) is a quarterly, hands-on session for girls ages 7-11 years old to connect in an interactive, intimate, and inspiring setting. This quarterly event is powered by The Persona Program, which seeks to empower girls by building confidence, developing character, and promoting proper conduct. This installment of BBB was all about confidence, self-love, and self-discovery. Jennifer was invited to share personal journey and read I Am Unique! to the girls. After the reading, Jennifer led the group in an activity. Each girl received a handout which asked them to identify something they loved about themselves and why. Want a copy of this coloring and activity sheet? Get it here.